Posted December 8, 2017 by Robyn & filed under Behind the scenes, General News. I have been painting full time now for just over 4 years, and I am thankful every day for the unbelievable opportunity to do so. One of the things I appreciate most about painting is that there is ALWAYS room for improvement and growth; there are always new things to learn, new skills to acquire. Developing personal technique is, in my opinion one of the most rewarding aspects of the painting process, for this is where true creativity and individuality is expressed. An integral part of the learning process is of course experimenting with new materials and determining what works best for you. A few years back, I discovered Belgian linen as a canvas option. I have since found it difficult to want to paint on anything else. The silky smooth finish to the linen is ideal for creating the fine brush strokes characteristic of my personal painting style. I then started experimenting with higher quality paint and was pleased to notice a tangible difference to certain aspects of my work. Inevitably it then came time to look for some quality brushes too… and, going down the road of locating new equipment it got me thinking about the journey my old brushes have endured thus far. 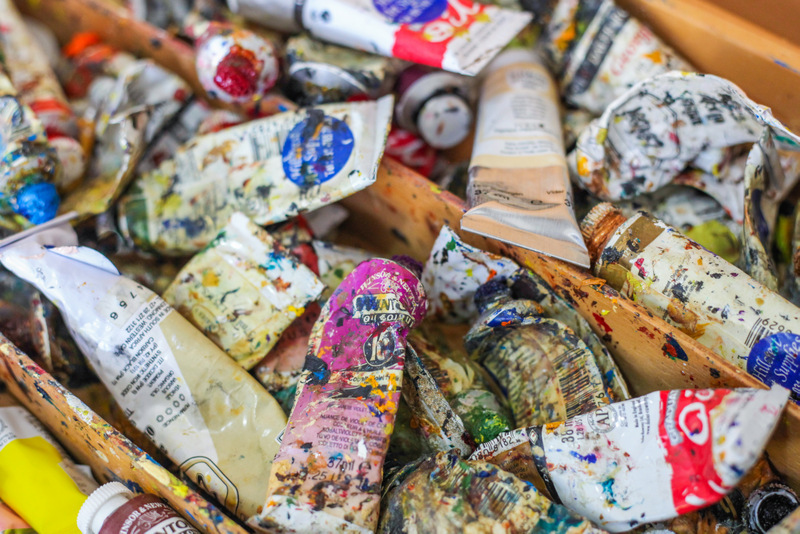 Like most artists, I enjoy getting involved in each step of the painting process, messy stages and all. 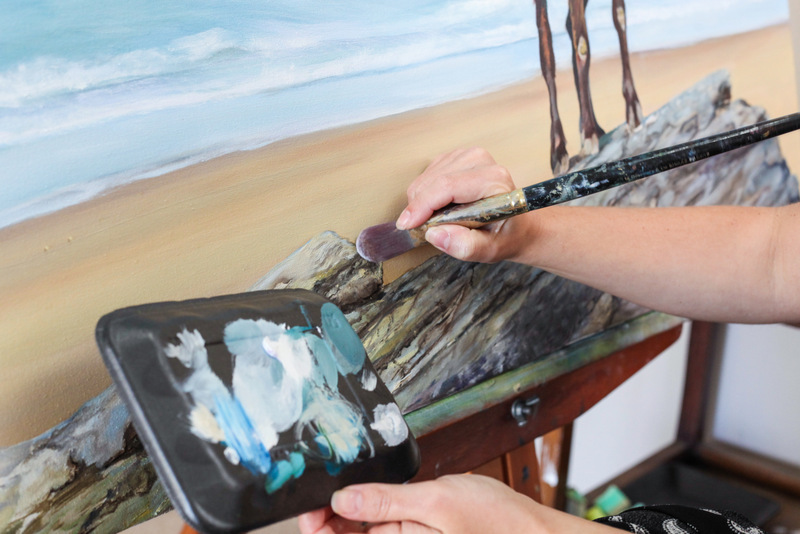 As someone who aspires to produce an end product that is fairly realistic, works unavoidably require a very steady hand and extremely neat, precise brush strokes at some stage of the process. Unfortunately said area of focus is pretty much the only region inside my studio where neatness and precision prosper. It’s not uncommon for me to involuntarily redecorate my outfit with oil paint. Wearing an apron doesn’t help much -I have accidentally sat on wet pallets in the past. 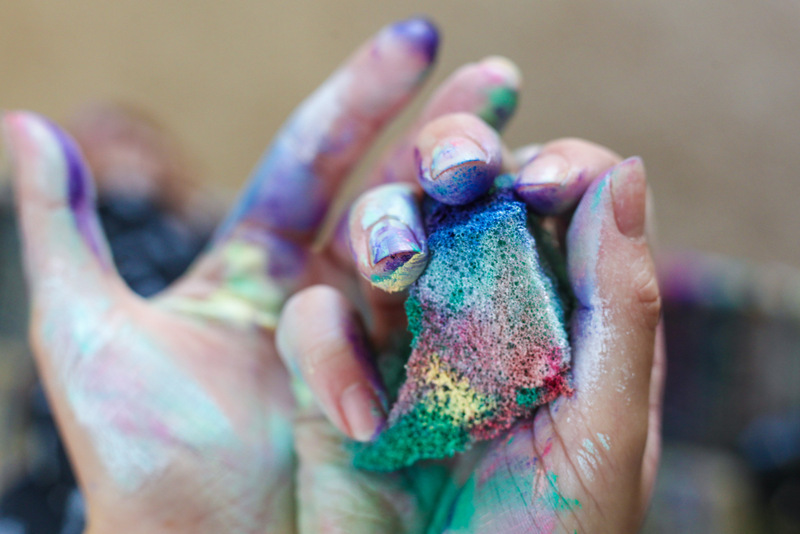 Regrettably, on a few occasions I have actually tasted the paint too… now that’s getting a little bit too involved if you ask me. But such is life! Still, amidst the organized chaos that is my studio, a level of comfort and a sense of personal belonging prevails. 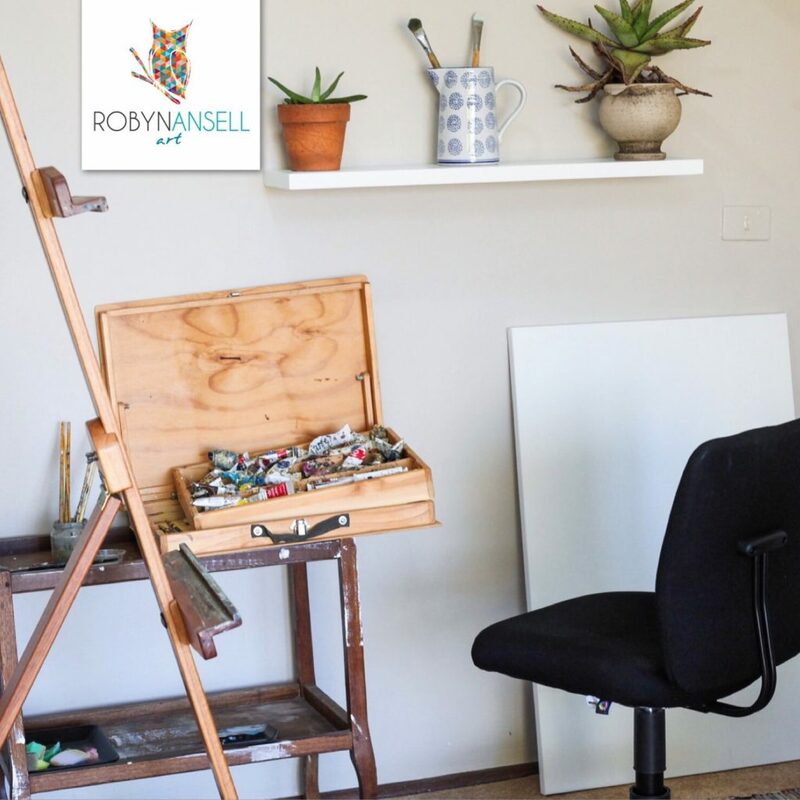 There are certain tubes of paint and a few brushes that have been part of my collection since school days, where I first started experimenting with oils. These items have been by my side through many an adventure, back and forth across the Limpopo river whilst I was living and working in Botswana, up and down from Winston Park to Ladysmith whilst I was living and working in Nambiti Private Game reserve, and of course, back and forth between home and Kruger Park. 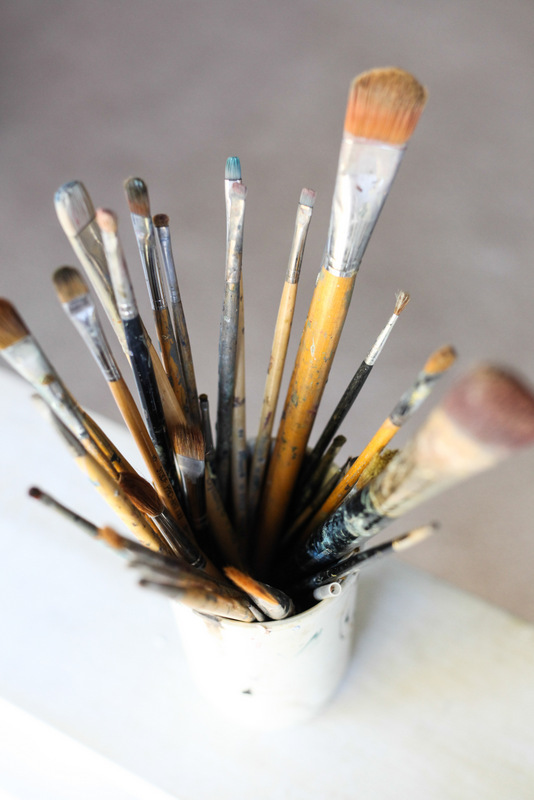 Brushes as you buy them off the shelf are not always the ideal shape to produce the results you desire. I have spent a fair amount of time sculpting my brushes with scissors and razor blades, perfecting shapes and angles that work for me, or at least that’s always the intention… Sometimes the consequences are disastrous! There have definitely been some casualties along the way, but the survivors work fantastically well and you eventually become quite attached to them, feeling as though you’ve played a hand in their development. When building up your collection of painting equipment it sometimes helps to think outside the box. 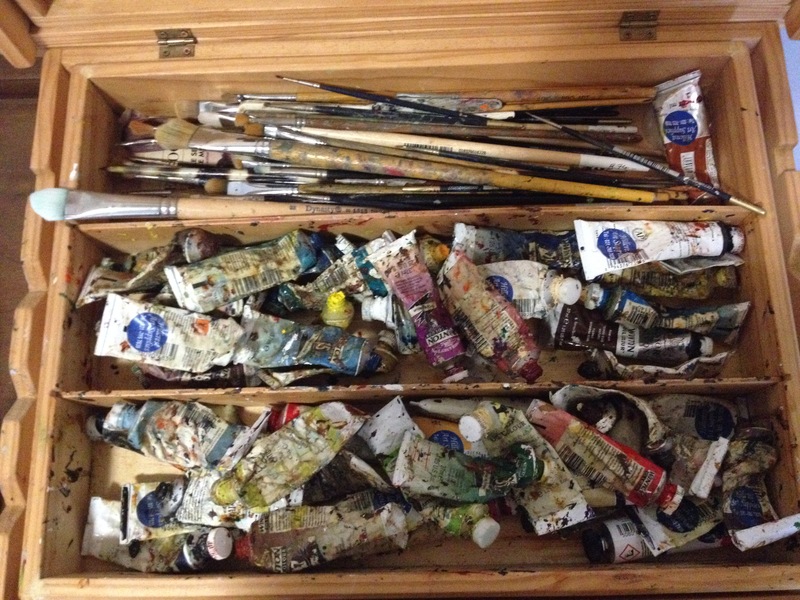 Being a messy painter, my paints are often separated from their caps. This causes a thin film of hardened paint to form across the tube opening- now despite considerable effort on my part to keep caps on tubes it still happens from time to time… on a regular basis. Sometimes you can squeeze the tube gently and the paint breaks through the film but on occasion the film is unnecessarily stubborn and therefore requires more serious measures. Whilst living in Botswana I found the perfect tool for the job… enter the porcupine quill. The porcupine quill is resilient and has, depending on which part of the porcupine the quill is from, two sharp ends of different thickness proportions, which can be used selectively according to the level of paint blockage. The thin end is also very useful for combing through old brushes to remove paint build up (which occurs over time despite wholehearted cleaning efforts). When you’re living in the bush they’re also pretty easy to come by… the porcupine quill has been part of my painting equipment ever since. 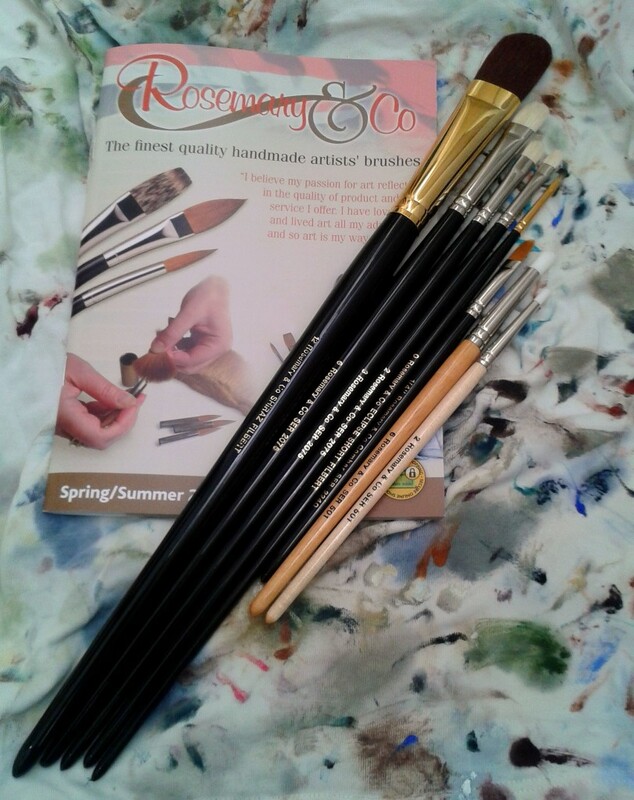 In my attempts to grow and develop my skills as a painter I ordered some new brushes from “Rosemary & Co” in the UK. They arrived a short while later and I have been most impressed with the quality .These brushes have been skilfully crafted by someone else’s hand (using tools a little more fancy than scissors and a razor blade I would imagine) and are specifically crafted to achieve unique effects when painting. I have been enjoying learning to work with them, finding the techniques that are most complimentary to the intended purpose of each brush. My fancy brushes are luxurious, I have since, and shall certainly continue to place future orders with Rosemary & Co, but this does not mean my old faithful brushes are replaceable. They may be aesthetically unappealing, appearing completely different in shape to the day they were purchased but that’s the charm of them. I know them so well, they work in perfect unison with my hand, they are familiar and reliable, they’re old friends really! 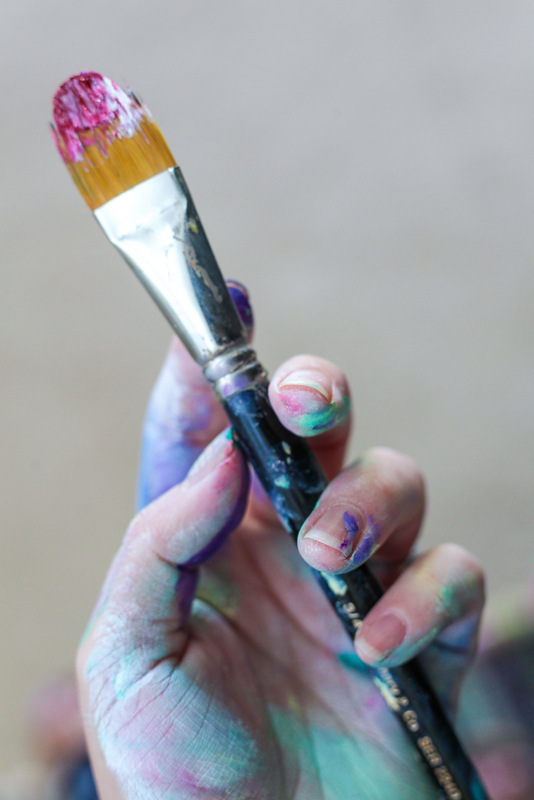 Paint brushes, like artists themselves are uniquely individual. Porcupine quills on the other hand tend to be pretty standard for the job at hand, you just need to keep an eye on them! I accidentally stepped on a porcupine quill as a small child; it went right through my foot and out the other side! This is definitely not an experience I wish to repeat but at least for now it looks as though porcupine quills and I are able to co-exist peacefully in a prime example of mutualism whereby I get a handy tool to assist me in creating my livelihood and they get a second chance to do something fancy. No matter your preference and the history behind it, at the end of the day it comes down to which tools work best for you. 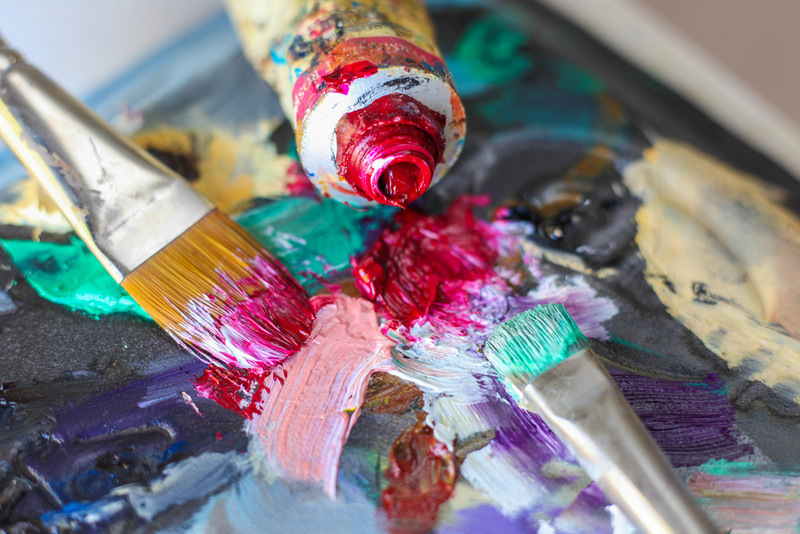 It’s important to enjoy creating your artwork and it’s equally as important to trust the quality and longevity of the finished product (especially if you intend to sell it to others). One of my favourite brushes is the last survivor of an extremely budget pack I managed to locate at Musina Spar in 2007. When working in Bots there wasn’t much of anything available to us in the isolated land of Tuli and shopping was not an easy affair. We would have to journey three hours through the bush, cross the Limpopo river at the border post between Botswana and SA (using a cable car during the rainy season) and then travel a further hour to reach the tiny town of Musina in an attempt to locate essentials which may or may not have even been in stock on that particular day. I was actually rather surprised to find art brushes at all. As expected most of the brushes in the pack were pretty hopeless and so it puzzles me to think why there should be one lonesome gem packed in there alongside its mediocre counterparts. 7 years later the handle of the brush has lost its varnish completely and the tip has that lovely ‘finger in the socket’ type hairstyle appearance, but I’ve yet to find another brush that matches it when it comes to building up depth, texture and detail. 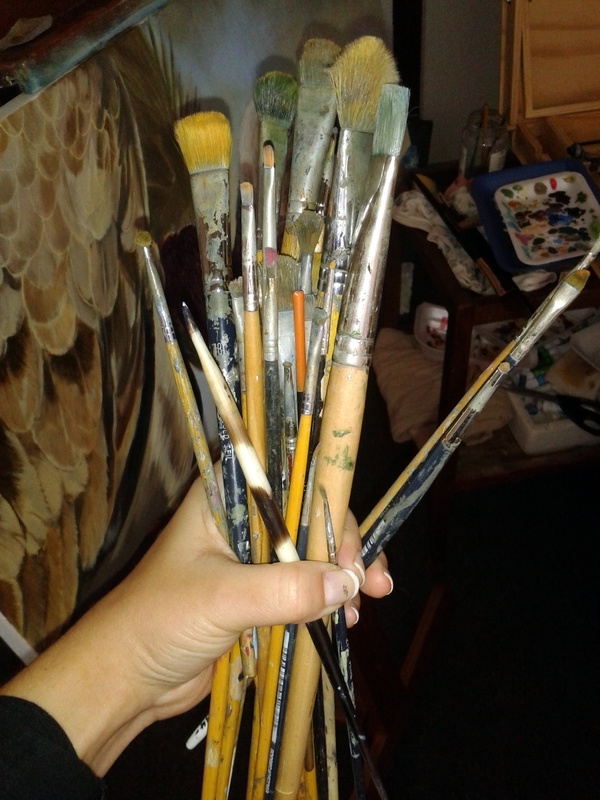 My old faithful brushes… complete with porcupine quill! I don’t know how this dear brush has survived all these years but it certainly has a great deal of character to show for it and each time I use it I’m reminded of extremely special times. I think that’s the key really, if you’re aiming to produce an end product that reflects character and heart , using tools that hold a bit of sentiment is a very good place to start ! Gran and I have loved reading your news letter and learning all about paint brushes and PORCUPINE QUILLS!!!! Also love the giraffe you have started on.